If you need help setting up your online payment, please call Harder Real Estate Group at (478) 287-2004. We will be happy to walk you through the online payment section of our website. We can also help you schedule recurring payments. We have set up a username and password for you. Once you are logged in, you can change your temporary password to your own. Your online tenant account is safe and secure – Rentech Direct uses the highest encryption possible to secure your information and process your online payments. Once you are logged into your account, you will see a summary of your tenant account, including your last payment, next payment date, notices from your Property Manager, and an account history. 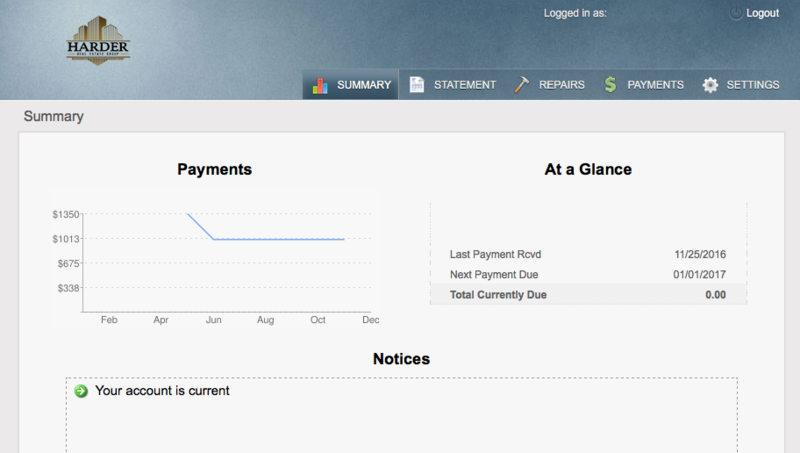 The “Statement” tab shows a summary of all payments, credits, and fees related to your account. The statement is available for monthly, quarterly, and annual view and can be changed with the drop-down box in the top left corner. 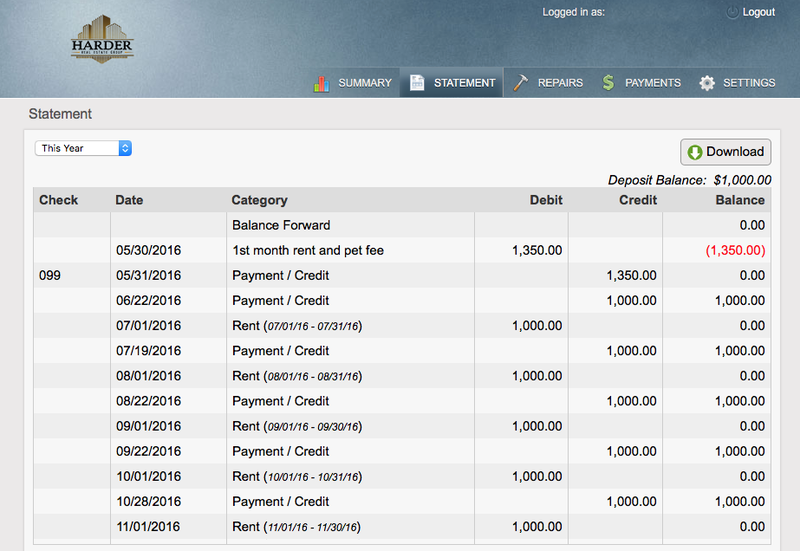 The statement screen also shows the property deposit (“Deposit Balance“) that you paid upon renting the home. You can download and print your monthly statement by clicking on the “Download” button in the right corner. 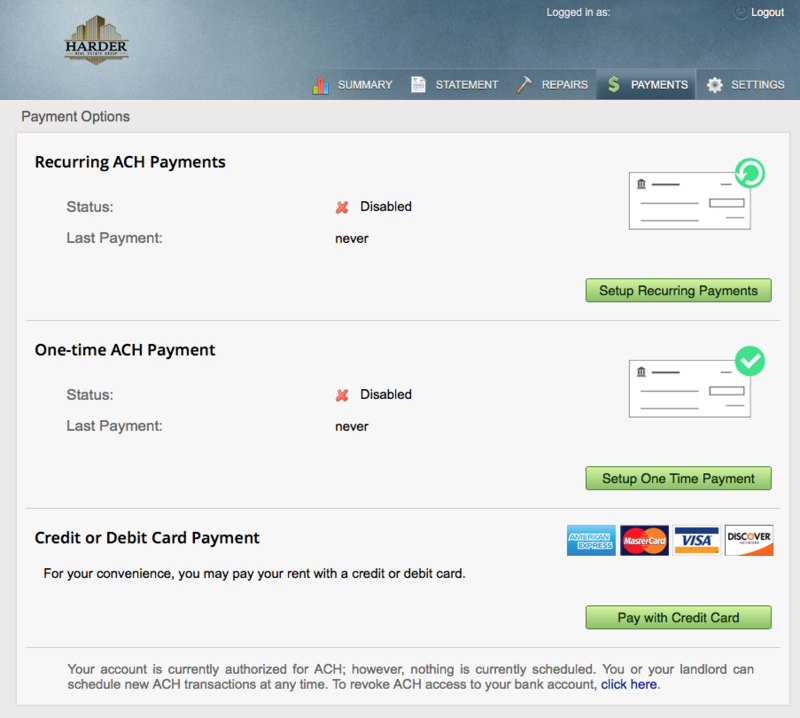 Recurring ACH Payments: Use this option to schedule recurring rent payments using your checking account. Recurring rent payments are free of charge. Please have funds available in your checking account the day of making the payment. The payment will be processed the same day. One-Time ACH Payment: Use this option to schedule a one-time rent payment using your checking account. One-time rent payments are free of charge. Please have funds available in your checking account the day of making the payment. The payment will be processed the same day. Credit or Debit card Payment: Use this option to schedule a one-time rent payment using a debit or credit card. We accept American Express, MasterCard, Visa, and Discover. All debit and credit card payments are subject to a 3% fee that will be added to your rent payment. *Returned check payments are subject to a $75 non sufficient fund (NSF) fee. The NSF fee must be paid in order for your monthly rent to be considered paid. Following the “Repairs” tab, you can see a history of tenant-manager communications with details about any repair issues. The screen is blank by default if you have not had any previous repair requests through our Rentech system. 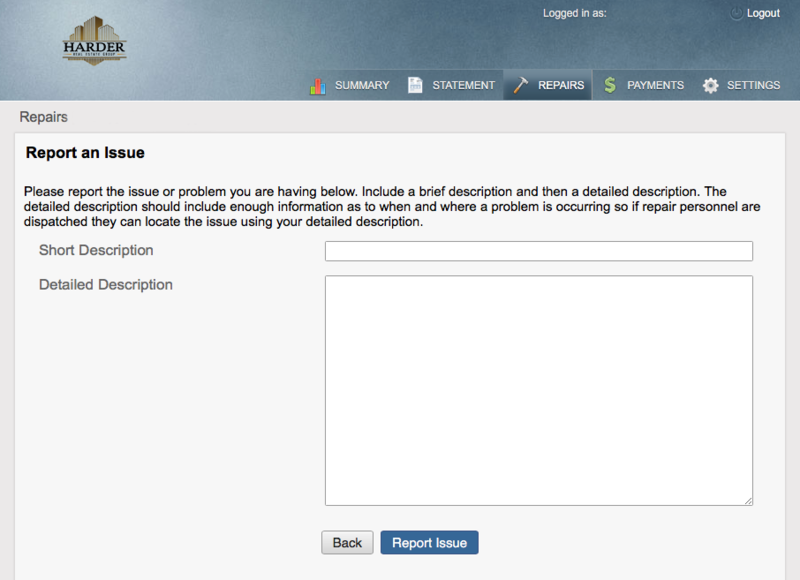 Click on “Report an Issue” in the right corner to inform Harder Real Estate Group about any repair issues. For emergency repairs, please call our office at (478) 287-2004. For all non-emergency repairs, please use this form to report an issue. Click on “Settings” to update your communication preferences. 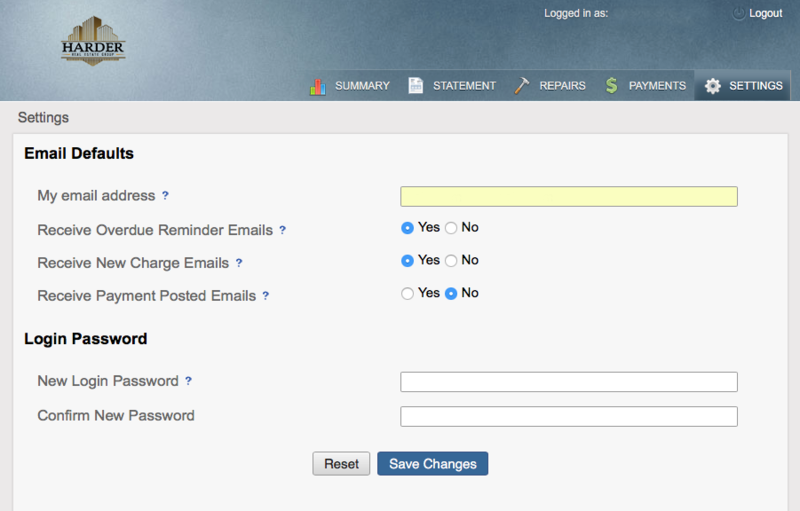 Here you can change your email address and select when and how often you would like to receive emails about your account. The “Login Password” section allows you to change your password. Harder Real Estate Group will set up a temporary password for you to log into your account for the first time. We highly recommend that you change the default password to your own. As always, you can visit our office located at 1217 S Houston Lake Rd, Suite 1, Warner Robins GA 31088 to make rent payments by check or money order. If nobody is available at our office you may seal your rent payment and use our dropbox to pay your rent. We will call or email you after receiving your rent payment.